A river ran through it, and ruined much. If you’re lost along Colorado’s Front Range, just look for the mountains. They are to the west, their craggy outline an unflinching and unfailing navigational aid. When I moved to Colorado, just seeing the Rockies’ profile against the huge sky helped me feel more oriented as I adjusted to my new home, my internal compass spinning every which way, not quite finding true north. Glimpsing the sun as it bounced off the snowy peaks or as it set against them in wild shades of pink and orange often turned a difficult day into a great adventure. If there was one thing I could count on, it was the power of the landscape to inspire me and fill me with gratitude. In classes at the Colorado Mountain Club, I studied topographical maps, which translate steep slopes into tightly clustered dark lines. Rivers and streams are blue, forested areas green. What was on paper corresponded to the physical world, a world that, to this newcomer, had a solidity to it. Of all the startling and heartbreaking stories that have emerged after the flood, one has grabbed me. The North St. Vrain Creek that runs through Lyons, CO, occasionally parallel to Route 36, that leads to Rocky Mountain National Park, moved itself 200 feet in some places, redrawing the town map and creating a disaster zone in its wake. About a month ago I drove through Lyons, a small, art-filled community, on my way to Estes Park and the mountains. As I had done before, I stopped for gas at “U Pump It”, a place that only recently installed credit card readers at its pumps; until then, they had trusted folks enough to pump first, pay later. Next I pulled over in front of the Barking Dog Cafe, whose green tea routinely hits the spot and helps with hydration on the way up to the mountains. Returning from the park, before reaching Lyons, I turned right across a narrow bridge over the creek to the Rock N River Resort, whose sign advertising a spa, wine and trout had intrigued me for years. Figuring it would always be there, I had never stopped until that day, when I had some spare time. I popped my head into their wine tasting room but, since I don’t drink, I treated myself to a package of their pecan smoked trout. On my way out of Lyons, I glanced over at Julie’s Thai Kitchen, a shoebox of an eatery tucked into an unassuming strip mall. It’s a relatively new addition to Lyons, open less than two years, which I discovered in June. Julie and her staff serve the most flavorful and fresh Thai food I’ve had outside of Bangkok and Chang-Mai. That day, however, I wasn’t hungry, so I didn’t stop in. The Rock N River resort, perched beside the creek that exploded into a roiling river, suffered serious damage in the flood. I don’t know about the other businesses, located further from the creek. Since the town is inaccessible, and currently without power, water and sewer, even if these establishment are physically intact they might not be able to sustain weeks or months of lost business. 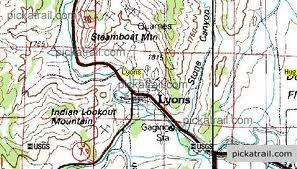 The commercial landscape of Lyons and other communities might also be changed by the flood, along with the town’s geography. It’s possible that Julie’s Thai Kitchen will remain a delicious memory. Whether we are aware of it or not, often we count on certain things to be in the same place. We might orient ourselves with rituals: stopping for tea or coffee at a favorite spot, getting gasoline at a familiar station, sitting on the same comfortable rock by a bubbling creek. When just one business closes or relocates, it can feel like a tiny death, tearing a hole in the fabric of routine, one that might not be quickly filled by a suitable substitute. When a few days of rain moves waterways and alters an entire area, it is breathtaking and sobering. This afternoon, while grocery shopping, I glanced at Boulder’s foothills as more storm clouds massed above their jagged profile. But today, even that familiar outline didn’t look so solid, so dependable. When the thunder came, it was with a loud clap, like a Zen master reminding students that everything is impermanent.